Like Wee Gee, Leonard Freed has a grand portfolio taken from slices of the street’s underbelly in New York City. 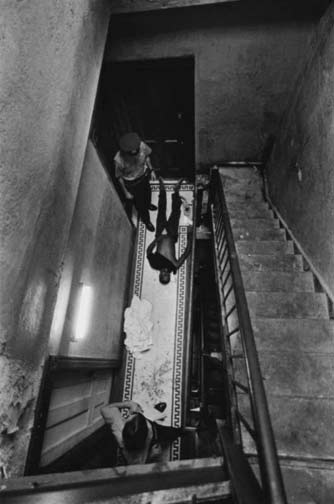 Police Work: Photographs by Leonard Freed, 1972-1979 features a selection of vintage prints by the Brooklyn-born photographer who documented "life on the beat" with NYPD officers during the tumultuous 1970s. During a time when New York City faced near bankruptcy and was internationally notorious for its high crime rates and social disorder, Freed’s photographs reveal the complexity, the harshness, and the camaraderie of the city’s public safety servants and the people they protected. Highlighting a recent gift to the Museum of the City of New York by his widow Bridgette Freed, the exhibition is a gritty, realistic portrait of ordinary people doing a "sometimes boring, sometimes corrupting, sometimes dangerous and ugly and unhealthy job."